When each of the two complementary colors is combined, they equal a neutral brown. 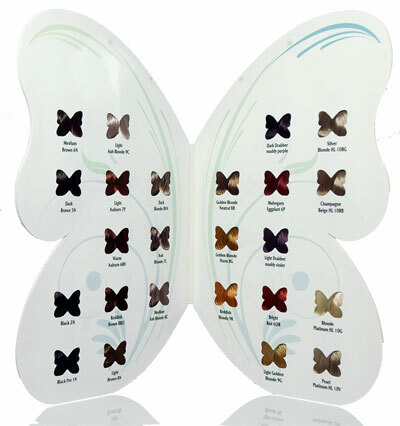 Most hair colors are defined by the lift/deposit ratio. This is commonly known as the level system. Level One means black and Level Ten means the absence of all pigments as the lightest blonde. Gray hair is also the absence of Melanin. There could be as much as two levels of color difference between two different manufacturer's hair colors of the same hair color. We suggest the only way to know these colors is to experiment on swatches. The next time you give someone a big haircut, save some hair and use it to learn what EcoColors Hair Color can do for you. When you lift hair with permanent hair color, you also deposit. The more you lift with a hair color, the less you deposit pigment on gray hair. The more you deposit with a hair color, the less you lift. For example, a black hair color (Level One) would have the greatest amount of deposit and the least amount of lift. Silver Blonde (Level Ten) would have the least amount of deposit and the most amount of lift. 1) If the hair has 25% or more gray hair, it is recommended to use a Natural shade as well as another desired Tone to color the gray hair. We will discuss gray coverage in detail later. 2) If the hair is porous you must decide on the desired shade. Sun, previous chemicals, blow drying, alkaline shampoos, inactive or low active thyroid gland and diet low in protein all contribute to porous hair. The results with porous hair are extremely varied. If you put a warm auburn on faded, over processed blonde coarse hair you might end up with pink or shrimp colored hair. On the other hand, if you put this same formula on healthy blonde hair that is not porous you might get a beautiful bright auburn color. There has been much research done about using 40 volume with bleach. The stronger the formula, the faster the melanin in the hair shaft dissolves. This may result in damage and weakening of the hair shaft. If you use a 20 volume developer or a 30 cream developer with bleach, the slower processing time allows the bubbles made to escape the cuticle layer of the hair shaft, allowing the melanin in the cortex to be dissolved / dispersed with little or no damage to the integrity of the hair shaft. Try experimenting with hair swatches of 20, 30 and 40 volume (and your bleach) applied to different swatches at the same time, with the same amount of heat and you will be surprised to see that 20 volume developer effectively lightens the hair with heat as the 40 volume, but with less damage. We only recommend doing these two chemical processes together if EcoColors hair color is used with a Regular developer (20 vol). Any process that requires stronger than 20 volume is not recommended if the client wants to have healthy shiny hair. We rarely perm and color the same head of hair. If we do, we recommend deposit only color (using 10 vol). If hair has been relaxed and in great condition, we only recommend coloring the hair with 20 volume on the previously relaxed hair at least one inch from the scalp to ensure there is no overlapping of relaxer and color when the new growth is redone with relaxer. This will protect against breakage. Relaxing the hair is an art (as hair color is) and is only as effective as the ability of the person applying the chemical. We recommend using a mild relaxer if you are also planning on coloring the hair. These services should be done a week apart. Please use your good judgment in deciding whether it would be beneficial for your client to have two chemical services done and advising your client of the possible damage that would occur. Even though EcoColors is a non-toxic and ppd free hair color, it is still a chemical process on the hair. Gray hair occurs because the production of the melanin pigment within the hair's cortex is no longer produced. There are different approaches to coloring gray hair, depending on where the gray is located on the head as well as the percentage of gray present. 1) Identify the natural hair color of the client's hair. Always use a natural base when re-pigmenting the gray hair. Another base (depending on desired shade) can be used along with the natural base. For example, you may use medium brown with light drabber to counteract the warm tones. You must experiment with proportions of drabber hair color to the natural tones to determine how much drabber hair color to use. It is safe to begin with three parts natural tone to one part drabber and then go from there. If the hair is still too warm, the next time you color the hair try increasing your drabber one more part, making it equal parts drabber to natural tone. The light drabber hair color is a violet base and will not give as much red coverage as the dark drabber. We usually use dark drabber with dark brown or black. 2) As a general rule, always formulate one hair color shade darker than the natural hair color when there is predominately gray hair present. 3) Identify the amount of gray hair in proportion to their age. 4) Is the client comfortable with gray? If they are not, what kinds of commitment are they willing to make to maintain the color you would apply? This includes cost and frequency of color application. 5) Discuss what natural undertones would show up when covering the grays and which approach in coloring would best suit the client. When using EcoColors hair colors on gray hair, we recommend using minimum 1 bottle for gray coverage application. After mixing the appropriate hair color formulation, apply the hair color by heavily saturating the gray hair shafts with hair color. Apply cotton around the forehead; cap and heat for the first 5 minutes to further open the grays. Then process the hair, cover with a hair cap and leave the hair color to process for the remaining 30 minutes and with no heat. For resistant gray hair allow the hair color to process for 40 minutes. Make sure you gently shake the bottles to blend all the natural oils before mixing. To prepare the hair color, mix equal parts hair color to developer, this is referred to as "full strength". When covering gray hair, be sure to apply the color mixture full strength to the new growth. Apply a plastic hair cap and heat under a dryer or heat lamp for 5 minutes. Then remove the client from the heat source. Leave on the plastic cap and allow processing time for 30 to 45 more minutes depending on the resistance of the gray hair. If you would like to re-pigment the previous colored ends, dilute your remaining hair color mixture by half water (filtered water is best) and apply the hair color to the previously colored hair. Allow to process 5 more minutes. Never apply full strength (20 volume developer) hair color to previously colored ends. Always apply 10 volume developer or less to previously colored ends. Watch the hair when using Fast and Extra Fast developers to desired shade. Equal parts Medium Brown and Light Drabber with equal parts regular developer (20 volume developer) for a level 6 brown color. Equal parts Dark brown and Dark Drabber with equal parts regular developer (20 volume developer) for a level 4 brown color. Equal Parts Golden Blonde Warm and Golden Blonde Neutral on 85% gray hair with equal parts regular developer (20 volume). Equal Parts Bright Red and Black (not Black Pro). Equal Parts Pearl Platinum and Light Ash Blonde with Extra Fast Developer (40 Volume). Three Parts golden Blonde Warm and One Part Warm Auburn with Regular Developer (20 Volume). ~ Mix Golden Blonde Warm with any red to make it Brighter. ~ Apply full strength (1:1 ratio hair color to developer) to new growth. ~ Apply with 10 volume developer to previously colored gray ends, apply full strength to new growth and diluted with water by half to the previously colored or porous ends. Put on a plastic hair cap. Then, five minutes of heat with cap and process 40 more minutes with no heat (cap remains). Hair color processing time is a full 45 minutes. ~Mahogany Eggplant is a pinky red hair dye. Never use it alone, except on brunettes with no gray hair. Works well mixed with medium brown or dark brown hair colors. Copyright © 2000-2019 EcoColors ®, Inc.
All rights reserved. No part of this publication may be reproduced, distributed, or transmitted in any form or by any means, including photocopying, recording, or other electronic or mechanical methods, without the prior written permission of EcoColors, Inc.
To order EcoColors Professional Hair Colors, it is simple, register your account with your cosmetology license number, and then contact us to activate your wholesale professional account. It will be instantly activated.